There must be a temptation when you’ve written a worldwide hit, in Gavin Sutherland’s case Sailing as performed by Rod Stewart, to sit back and watch the royalties roll in. Yet Sutherland has quietly kept exploring his bluesy roots and mastering the art of musical understatement in his solo recordings. More recently he’s explored social media to collaborate on projects with friends and family. 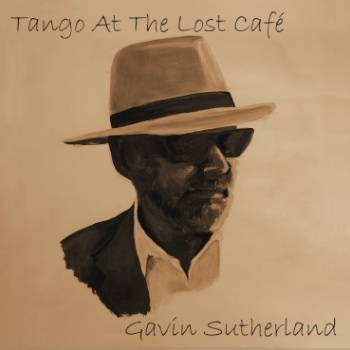 Sutherland writes on his website of not having been sure where his music was heading until he chanced upon a tango session at Mike’s Old Bus depot in new Pitsligo, next door to the Lost Café in New Pitsligo, near Peterhead. The CD he’s produced after being tutored around this Aberdeenshire dance floor by a young woman called Kirsty is perhaps his most complete work since the days of Sutherland Brothers & Quiver. He even looks the part on the cover, a touch Mr Del Monte. Like Diamonds & Gold from 1999 and 2008’s The Deal, Tango comes from the less is more school of rock. Laid back much of it sounds at first hearing, but there’s a deceptive beat that could have you up and on your feet with the right partner in the right place. There’s more than a hint of JJ Cale in the backing tracks crafted by Sutherland on guitar, bass, drums and even sax. Drummer Billy Rankin (I think it’s the one who played in Brinsley Schwarz and Ducks Deluxe, and not the former Nazareth guitarist) is on four tracks and former bandmates Tim Renwick and Willie Wilson contribute guitar and mandolin parts by email on the title track. The sum of the parts is all the greater because of the economy of the playing by a cast of Sutherland’s musical friends – a brass fill here, a deft vocal harmony there – including backing vocals from his brother Iain on the rocking Two Tone Shoes (Let it Roll) and harmonies from Americana singer/songwriter Nancy K Dillon (a satellite contribution from Seattle) on Something I Said, an achingly lovely song that would be a number one hit in a just world. Sutherland’s lyrics match the playing, making their point then moving on to the next number. The inane tweets of people with nothing to say but a determination to say it anyway are skewered in The Tweeter. Sutherland has played three rare gigs with three different line-ups since the album slipped out with too little fanfare in the summer. His life and his music is clearly rooted around his north-east Scotland birthplace now, but this isn’t backward looking. Tango was recorded by James Hunter at Arc Recording Studio, located in a country park at Mintlaw. The studio is mainly used for traditional Scottish music but was one of the first in the country to embrace 5.1 Surround recording. The Sutherland Brothers, with or without Quiver, were one of my favourite bands of the 70s and watching SB&Q perform was a highlight of my time as a student journalist with Ripple at Leicester University. Now I’m just hoping the gap before Gavin Sutherland’s next album is not so long. This entry was posted in Music and tagged Aberdeenshire, Arc Recording Studio, Blues, Boogie, Gavin Sutherland, harmonies, New Pitsligo, Sailing, Scotland, Sutherland Brothers & Quiver on October 17, 2013 by paulnettleton.